Today’s messy situation was submitted by Ruby, and she wants to know how to successfully combine her home office area with her kids’ toy room! 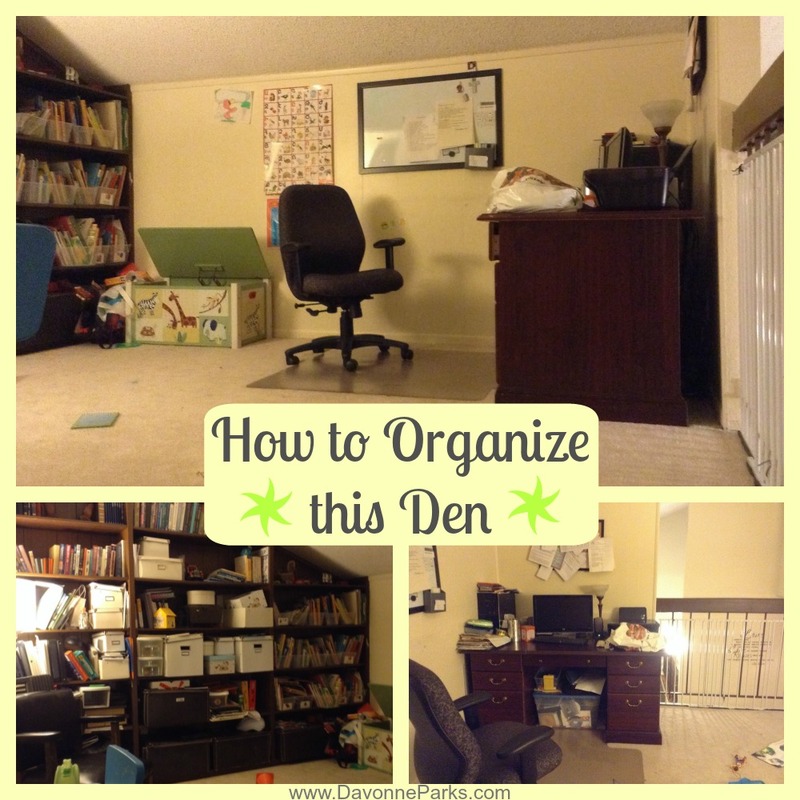 My den has three purposes: play room, library/study room, and office. However, aside from the play room and paper clutter, we don’t want to be there to read, study or do office work. I try my best to keep it clean and making it look organized but I can’t find anything we are looking for. Ruby, thanks for sharing about your space with us. I love your wall color – in fact, I just painted my living room a similar color! The first thing that needs addressed is the built-in-shelves. Those offer great storage and I can see where you’ve used some boxes and baskets to organize things. But I think you need to take it a little further. 1) Did I like it? If not, then donate it. 2) Does it fit with my values and morals? If not, then out it goes! 3) Will I read it again? No? Give it away to someone who can enjoy it. 4) Do I even want to read this anymore? If you’re holding onto books you haven’t read, make sure that you’re still interested in reading them. If not, put them in your donation box! Asking yourself those questions, and answering honestly, will help you to donate more books than you thought you’d be able to. And when you’re done, you’ll only have books that you read, love, and are proud to display! Once you’re done sorting through your books, move on to the documents. Go through your either bookshelf or your desk first, then organize the other. 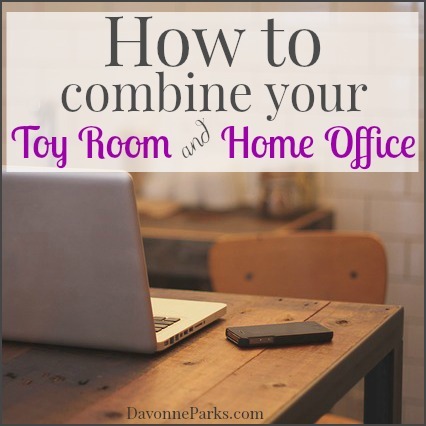 Don’t try to sort both areas at the same time or you’ll end up with a huge, overwhelming mess that you won’t want to finish! While you’re going through your documents, if you feel overwhelmed and need some quick successes, make sure to read my article about how to quickly simplify the paper clutter. After you have paper clutter to a manageable level, make sure to read Melanie’s article about thoroughly organizing – and maintaining – the paper mess. From what I can see, it looks like you have your kids’ things mostly under control. Since you specifically asked about their school papers, definitely read this article about how to sort the school papers and other childhood mementos. If you need any help with purging some of their toys, read this article about how to know what kids’ toys to keep and which ones to toss. Keri shares how to use baskets and bins to make a large shelf look beautiful. Dani tells how to beautify the home office. Laura talks about using boxes and jars to make storage item looks pretty. While you’re reading those articles and thinking about ways to make your den feel really inviting, remember to shop your house first! A rocking chair in the living room, some artwork on the fridge, or a cute rug in the kids’ room may be just the thing you need to bring to your den to give it an even more inviting feel! For more inspiration on how to frugally organize a space, check out this article about how I decluttered and organized my entire home without spending a dime. I hope this helped you, Ruby! Don’t forget to share photos of your success story so you can receive your $5.00 gift card after you’re finished! PS If you’d like FREE virtual organization tips for your own space, go here to see how you can submit photos and questions about your mess!